History: (X-Men I#100 (fb)) - When Dr. Steven Lang was still the head of a government project to determine why mutants existed, he came across Larry Trask's old Sentinel technology which convinced him that mutants had to be exterminated. With funding from the Hellfire Club's Council of the Chosen, Lang created Sentinel duplicates of the original X-Men in order to have them destroy the X-Men and eventually, all mutants. (X-Men I#99) - While the X-Men battled Sentinels in outer space, Dr. Steven Lang captured Jean Grey and Professor Xavier. Jean soon contacted Cyclops using telepathy and the X-Men made their way back to their captive friends. 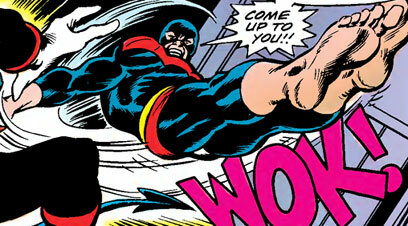 When Cyclops arrived, he began to beat Lang until someone blasted him from behind. The other X-Men soon arrived and found the original "X-Men" waiting for them. 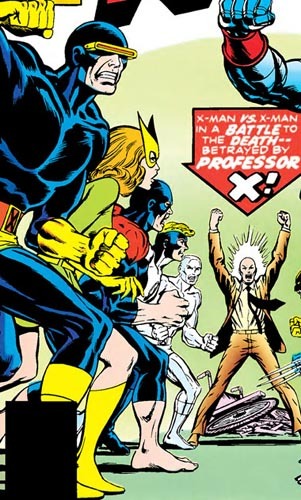 The "X-Men" called the newer members (such as Wolverine, Colossus, Storm, Banshee, and Nightcrawler) imposters and "Professor Xavier" ordered his "X-Men" to kill the imposters. (X-Men I#100) - A battle between the original "X-Men" and the newer team soon erupted that resulted in Wolverine deducing that the original team were not who they seemed. He then savagely clawed "Jean Grey" apart, revealing her to be a robot while Dr. Steven Lang explained to his captives that the original team were his own creations, which he dubbed the X-Sentinels. During the course of Lang's rant, Cyclops escaped his nega-tube prison and freed the other captives. Cyclops then battled Dr. Steven Lang and his flying gunship as the other X-Men continued to destroy the robotic X-Sentinels. With the X-Sentinels destroyed, the X-Men regrouped with Cyclops and the others as the Orbital Base began to rumble with explosions caused by the battle with Lang. 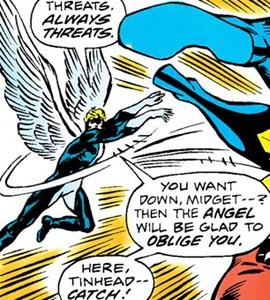 The X-Men and their friends then exited the base thanks to the real Jean Grey telepathically absorbing Dr. Peter Corbeau's shuttle-flying expertise. Comments: Created by Chris Claremont, Dave Cockrum, and Frank Chiara. The Havok and Polaris robots were created by Chris Claremont and Dave Cockrum. The Angel robot had the memories of the real Angel around the time period that the robot was based on. During the battle with the X-Men, the Angel robot tossed Wolverine into Colossus, knocking them both down. When the X-Sentinels were outed as robots, the Angel robot was quickly destroyed. The Angel robot had simulated-feather wings that allowed him to fly. The Beast robot had simulated memories of the real Beast circa the time period he was modeled after. During the X-Sentinels' battle with the X-Men, the Beast battled Nightcrawler, where he tossed Nightcrawler into the Cyclops robot, who blasted Nightcrawler into unconsciousness. Not long after Wolverine revealing the X-Sentinels as being nothing more than robots, the Beast robot was destroyed. The Beast robot had superhuman strength and agility, like the real Beast. The Cyclops robot, like the other X-Sentinels, had the memories that the real Cyclops had prior to the formation of the new X-Men. When the X-Sentinels battled the real X-Men, the Cyclops robot blasted Nightcrawler unconscious before being destroyed by a lightning bolt from Storm. The Cyclops robot could project energy beams from the visor on its face. 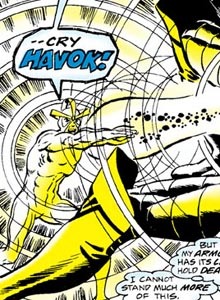 The Havok robot also had the memories that the real Havok possessed prior to the formation of the new X-Men. During the battle with the X-Men, Havok battled Colossus until he was destroyed along with the other X-Sentinels. The Havok robot had the ability to project plasma blasts from its body. 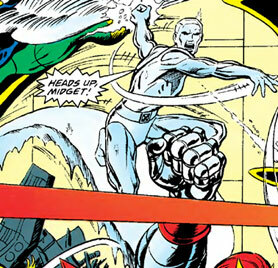 The Iceman robot had the memories that the real Iceman had prior to the formation of the new X-Men. He aided in the battle against the X-Men, but was eventually destroyed along with the other X-Sentinels. The Iceman robot possessed the same ice manipulation abilities as the real Iceman. The Marvel Girl robot had the memories that the real Jean Grey had back when she used the Marvel Girl codename. During the X-Sentinels' battle with the real X-Men, the Marvel Girl robot battled Storm until Wolverine deduced that the "X-Men" were actually robots and destroyed her. 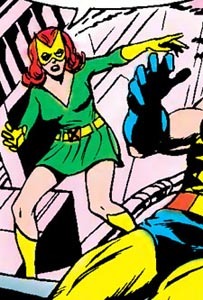 The Marvel Girl robot had the same telekinesis that the real Jean Grey possessed, although it was at a lower level than the real Jean and the robot did not have the real Jean's telepathy abilities. The Polaris robot had the memories of the real Polaris had prior to the new X-Men's formation. She aided the Marvel Girl robot against Storm until she was destroyed by the Banshee's sonic scream. The Polaris robot had the same magnetic energy control that the real Polaris had. The Professor X robot presumably had the memories of Charles Xavier prior to his forming of the new X-Men, although the robot was intent on having the other X-Sentinels kill the real X-Men. He ordered the X-Sentinels to kill the X-Men, claiming they were imposters, until Wolverine discovered the X-Sentinels' robotic nature. After that revelation, the Professor X robot was quickly destroyed along with the other X-Sentinels. The Professor X robot claimed to have telepathic powers, although he didn't really have enough time to display them. He could, however, walk without the use of a wheelchair and was considerably stronger than the real Charles Xavier, who was confined to a wheelchair at the time.